Discussion in 'Tutorials and How Tos' started by Cheebs, Jan 19, 2008. 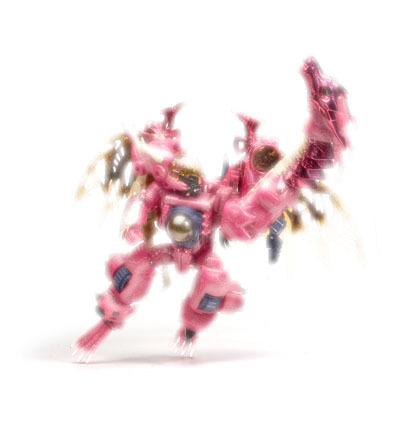 This is for everybody to share [my] knowledge in relation to photographing toys. One of the best tips I ever received was from someone on this board (I think it was Shadowed), so I thought I'd pass on what I learned. So....here's how I go about photographing a toy. The first thing I do is select a good pose. 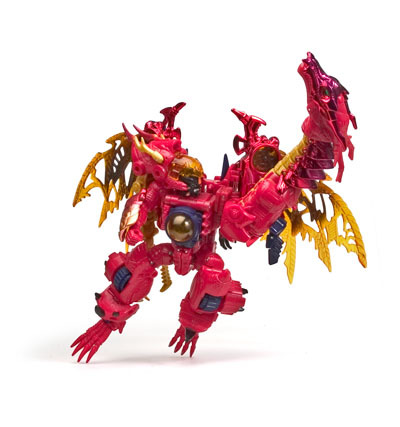 Many pictures are just to illustrate what the toy looks like. In that case, you may just want to show the toy straight on standing at rest. If that's not the case, you will want to put the toy in an action stance or something. Anyway, take your time and position the toy exactly as you want it. No detail in the positioning is too small. Every foot joint, wrist joint, and especially head joint is very important. You may want to use a supporting structure to hang the toy in mid-air as I have in this example. The supporting structure should block as little light as possible and cast as few shadows as possible. The pose angle and composition are good, but I couldn't evenly light the background from this position. The lighting is better and more even, but the angle isn't as dynamic and looks a little flat. It's still not as dynamic as the first photo, but it looks better than the second photo and still has lighting that we can work with. It would be nice to try and salvage the first photo (and I might try that some day if I'm up for a challenge), but the lighting is really bad, and it is not good source material. We'll go with the third photo. The point is to keep your options open and not be afraid to take more photos than you will actually use. More choices is better. Now that we've chosen our photo we'll move on to . . . .
Before you do anything involving layers and cutting and filters and what-not, we need a perfect photo to start with. Take this time to remove any scratches on the white paper, remove any support strings that the toy was hanging from, any dirt from the lens, any chips in the Transmetal, etc. Once you have done that MAKE A COPY OF THAT LAYER AND NEVER TOUCH THE ORIGINAL LAYER. This is your starting point. It is important to always have a clean copy to go back to when needed. Make sure your background layer is white. 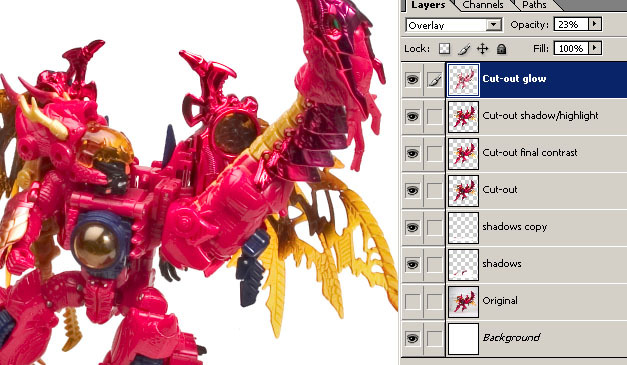 The first step is to cut out the figure on the copy of the layer you just made. This is the most important step to creating a believable effect. If your cut-out is sloppy, the finished product will look pasted-on. Be ready to get the detail work done with the polygon lasso zoomed way in. Now, make a copy of the original uncut layer and place it under the cut out layer. This will be the shadow layer. Use the polygon lasso with a high feather setting to cut out most of the area that is not relevant shadows. This photo shows the cut-out figure layer on top of the feathered cut-out shadow layer on top of a pure white background. The trick is to adjust the brightness and contrast of the shadow layer until the "fringes" fade to pure white. Once that is done, use the polygon lasso again with a high feather value to cut out any of the leftover "crap" on the shadow layer. 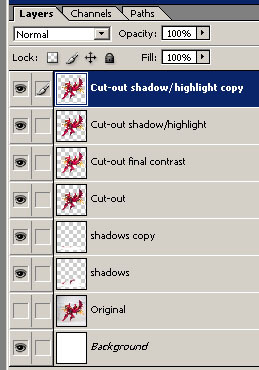 To make the shadow darker (if needed) copy the shadow layer on top of itself and set the blending mode of the top shadow layer to "multiply". Change the opacity as needed. The last thing to do is tweak the figure itself. 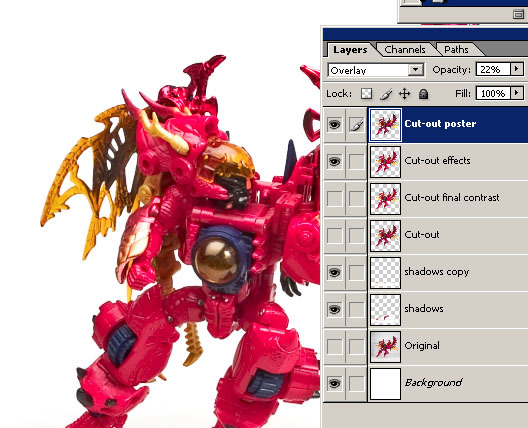 Make a copy of the cut-out figure layer. You worked hard to make that cut-out, and you don't want to do anything to permanently screw it up. 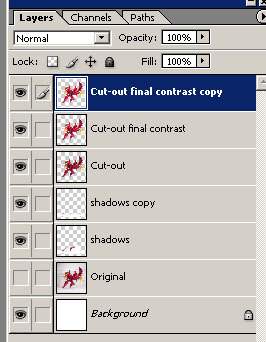 Adjust the levels, brightness, and contrast of the cut-out copy level until the picture looks finished. First things first, keep a copy of the figure cut-out with the final levels, brightness, contrast tweaks. You'll want to base your filters off of that, so always make a copy of that to apply any filter. We're going to apply filters to the "cut-out final contrast copy" layer. Start with the shadow-highlight option under "Image/Adjustments/Shadow-highlight". Tweak as needed to bring out the 3-D details. Boost the mid-tone contrast for more "oomph". Don't be afraid to to a bit into "unrealistic" territory because we will be blending this back in with the unmodified layer later. Once you are done the shadow/highlight rename the layer to "shadow/highlight". OK, copy the shadow/highlight layer. We've got a ton of layers now. Take that new copied layer and apply a HEAVY diffuse glow filter to it (Filter/distort/diffuse glow). Rename the layer to "glow". Now change the blending mode of "glow" to "overlay". Take the opacity slider down until the glow layer blends nicely into the shadow/highlight layer under it. . . . . and there you go - nicely lightened. I like to collect my effects layers, so merge "Shadow/highlight" and "glow" into one layer labeled "effects". This one's great for sculpts with a ton of detail. Made a copy of the "final contrast" layer (it should be right under the "effects" layer). Move this copied layer to the top of the layer stack. Apply the Poster edges filter (Filter/artistic/poster edges). Use an edge thickness of 1, and edge intensity of 1, and posterization of 0. Re-name the layer "poster". Now blend it into the "effects" layer under it. Just like we did before, set the blending mode of "overlay" (or "screen" depending on how your picture reacts) and bring the opacity down until it looks right. Trust me, a little bit of this one goes a long way. Now merge the "poster" layer into the "effects" layer to make a new complete "effects" layer. After the merge, feel free to do another levels, brightness, contrast tweak to the finished "effects" layer. Ok, your "effects" layer (on top of the stack so it's all you see) is pretty intense by now. It might not look so realistic . . . . The "final contrast" layer should be directly under it. Feel free to bring down the opacity of the "effects" layer to let a desired amount of the "final contrast" layer show through. This "reels it in" a bit. Ok, now that the photo is pretty much done, here's a little trick to really make it glow. Select the whole canvas. Click "copy merged" from the edit menu. 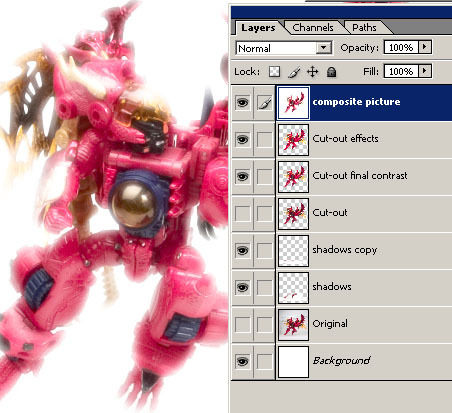 Paste the composite picture on the top of the layer stack. 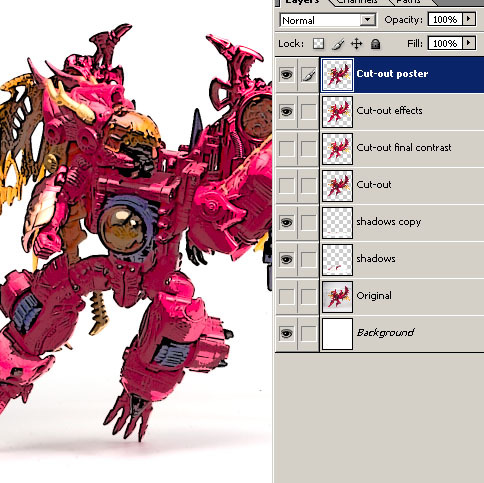 Perform a light "Diffuse Glow" filter to the whole composite picture layer. So there you have it. A lot of this stuff is pretty subtle . . . but it's the subtle details that make it.